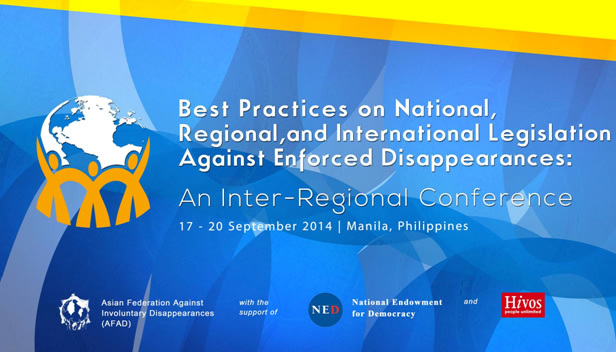 We Remember founder Irina Krasovskaya attended the inter-regional conference Best Practices on National, Regional and International Legislation Against Enforced Disappearances in Manila, Philippines. The conference took place on September 17-20 and was attended by representatives of associations of families of the involuntary disappeared persons all over the world, as well as by diplomats, researchers, human rights activists. The conference statement is in the documents section. Organized by the Asian Federation Against Involuntary Disappearances (AFAD), this inter-regional conference, which aimed to share best practices in advocating legislation, has gone beyond sharing of experiences on legislation. This sharing of experiences has transcended discussion on legislation and comprehensively tackles the imperative for truth, justice, reparation, memory and guarantees of non-repetition. Below is Irina Krasovskaya's speech during the conference. Dear friends, I am very happy to be back in Manila again. I am happy to see my friends from the Philippines, Indonesia, Nepal, Chile, Argentina, Kashmir, El Salvador, and Guatemala and from many other places where disappearances occurred in the past or still continue in the present. It is a privilege to be among people who understand what disappearances are and how important unity and solidarity are in searching for truth and justice. Enforced disappearances are not only a phenomena of Asia or Latin America. They have occurred in the past and are still happening in Europe. In Spain, the Balkans, in the Euro-Mediterranean region, and throughout the post-Soviet countries there are still have thousands of unsolved cases of disappearances. Mr. Destan Berisha will tell you about a very tragic part of Europe – the disappearances in post Yugoslav countries during Balkan wars. I am from another European region called post-Soviet countries. I am from Belarus, a country which is situated between Russia, Poland and Ukraine and which like other countries was a part of the USSR. And like other republics in this region Belarus became independent after disintegration of Soviet Union in 1991. Fifteen countries became independent but the problems which created the problem of disappearances did not vanish with the collapse of the Soviet Union. Ethnic conflicts, territorial conflicts, wars of aggression and, of course, undemocratic governments have all contributed to the continuation of disappearances. In Russia there are thousands of disappeared in the republics of Ingushetia, Dagestan and Chechnya. In Chechnya human rights groups estimate that between 3,000 and 5,000 people have “disappeared” since the beginning of the conflict in 1999. Most of them are believed to be buried in several dozen mass graves. All of these people were civilians and unarmed when taken into custody. In Ingushetia my friend Magomed Mutsolgov set up his own human rights organization, Mashr (Peace) when his brother disappeared, and over the last few years has collected information about more than 230 cases of abduction and enforced disappearance which have occurred since 2002. By his information more than 7,000 people disappeared in South Caucausys since 1992. In Dagestan numerous of young men were abducted between the late 1990s and now. A growing number of disappearances have raised concerns among human rights groups. Russian Human Rights organization Memorial reported that instances of enforced disappearances have increased since January 2013 presumably linked to Russia’s efforts to improve security before the 2014 Sochi Winter Olympics. Between January and October 2013, men in unmarked cars abducted fifty-eight people in Dagestan, nineteen of whom have yet to resurface. Ukraine – is another country which raises concerns about growing abductions and disappearances since the current conflict, started in February 2014. Until this year there was only the case of journalist Georgy Gongadse who disappeared in 2000. The new Ukrainian government tried to solve the case and the perpetrators were arrested but there are still no names of those who ordered the killing of the journalist. And now in Ukraine there are hundreds of victims. There is no exact information about disappeared people but in the report of Office of High Commissioner 717 military and civilians were reportedly abducted by paramilitary groups in East Ukraine during four month this summer. Everyone hopes that those people are still alive and will be released as soon as the conflict recedes. I would like to mention also another post-soviet country Turkmenistan (which is in the Asian part of former Soviet Union). Dozens of former officials have been forcibly disappeared there, some for more than a decade. Most of the disappeared were sentenced to lengthy prison terms in several massive waves of arrests and unfair trials on trumped-up charges that took place at the end of the 1990s and early 2000s. In many cases, their families have been able to learn nothing about them from the government ever since. Many families of the disappeared simply don’t know whether their loved ones are dead or alive. I met with the son of Boris Shikhmuradov, former ambassador and Minister of Foreign affairs who was sentenced to 25 years after a one-day trial in December 2002 and a few days later convicted to a life sentence through an extrajudicial decision of the National Council. Families of the disappeared have had no official information about the fate, whereabouts, or health of their loved ones since their arrest and trial. The authorities have allowed neither correspondence nor visits. In several cases, in a form of collective punishment, the authorities have arrested the relatives of the prisoners, had them fired from jobs, confiscated their property, or denied them permission to travel abroad. Disappearances also occurred in the South Caucasus countries of Armenia, Azerbaijan, and Georgia. Again this can be attributed to different conflicts: ethnic, territorial or war. In Belarus we have a different situation. All disappearances have happened because of the dictator’s fear of losing power. The illegitimate president of Belarus has been in power already for 20 years, which is not in accordance with the constitution. And that explains why there are political disappearances in Belarus. All of these political disappearances happened just before the second presidential election. The election of 2001 was to become the turning point for democracy in Belarus. The political killings turned out to be the first step in establishing a dictatorship. Kidnapping and killing the most powerful politicians allowed the president to monopolize power and to turn what was a promising Belarus into the last dictatorship in Europe. If disappeared politicians were alive, today we would be living in a completely different Belarus. One of disappeared in Belarus was my husband. That was not the first political disappearance in Belarus, and unfortunately not the last one. In May 7th, 1999 Yuri Zakharenko, General and former Interior Minister, leader of opposition Unit of officers, was kidnapped while going home after parking his car. On September 16th, Victor Gonchar, former Vice-Speaker of Parliament and former Chairman of Central election committee, and my husband Anatoly Krasovsky, a businessman who financed the opposition, were blocked in their car and taken away by unknown people. On July 7th, 2000 Dmitry Zavadsky, a journalist and former private camera men of Belarusian president was kidnapped on his way to the airport. For 15 years we have been trying to find the truth. In Belarus legal instruments for justice in cases of enforced disappearances cannot be successful because there is no political will to solve those cases. The same people who are suspected in organizing the crime are still in power. The president’s orders have more power than the law. The main suspect in orchestrating this crime and a close ally of the president was appointed as the Head of Administration of the President after being a Prosecutor General. Then he was promoted to Secretary of Security Council of Belarus, then the Head of department of Presidential Affairs. The same people are in power for 20 years. With the help of our lawyers we tried to use legal procedure inside the country. We sent hundreds and hundreds of requests, demands, and questions to the investigators and their supervisors. We got responses for all our papers. But officials rejected our petitions, which were aimed to bring to life our procedural rights (including the criminal prosecution of the suspects) without any grounds and they did not carry out any of the investigation we asked for in our petitions. Some chance for justice might come from the UN Human Rights Committee, but again not for Belarus. My daughter and I won the case against Belarus in UN HRC established under the International Covenant on Civil and Political Rights. In April 2012 The Human Rights Committee concluded that Belarus had violated its obligation to investigate properly and take appropriate remedial action regarding Mr. Krasovsky’s disappearance. The HRC requested Belarus to provide the victims with an effective remedy, which should include a thorough and diligent investigation of the facts, the prosecution and punishment of the perpetrators, adequate information about the results of its inquiries, and adequate compensation to the victims. The State party should also take measures to ensure that such violations do not recur in the future. This means that not one single judgment of UN HRC under ICCPR won by citizens against Belarus was acted on by the Belarus state. Russia, Belarus, and Turkmenistan all have one thing in common – they did not sign the Convention to Protect All people against Enforced and Involuntary Disappearances. Today is very sad day of my life. My husband disappeared 15 years ago on September 16th. It is not possible to believe that this can happen in the 21st century in the center of Europe. But it happened to my husband, and it happened to me. 15 years of searching for truth and justice for my husband, my family, and myself. Maybe, this is a short period in world history, but is a huge and intolerable time for families; every day we pass through hope to despair. Every day is filled with emptiness, sadness and grief. I do not want anybody else repeat my experience. So that is why our organization of families of disappeared in Belarus which we call WE REMEMBER is working hard as a member of the ICAED to call on all countries to sign and ratify the Convention against Disappearances. We all have to make greater efforts to achieve our common goal: to see the world without disappearances.